This winter, I subscribed to a winter CSA, which means I have enough carrots in my fridge to feed about 10,002 rabbits. I’ve made three different variations of carrot soup, and I have the leftovers in my freezer (and a handful of Insta Stories) to prove it. In other words, it makes me very happy to come up with a new recipe idea that involves carrots. 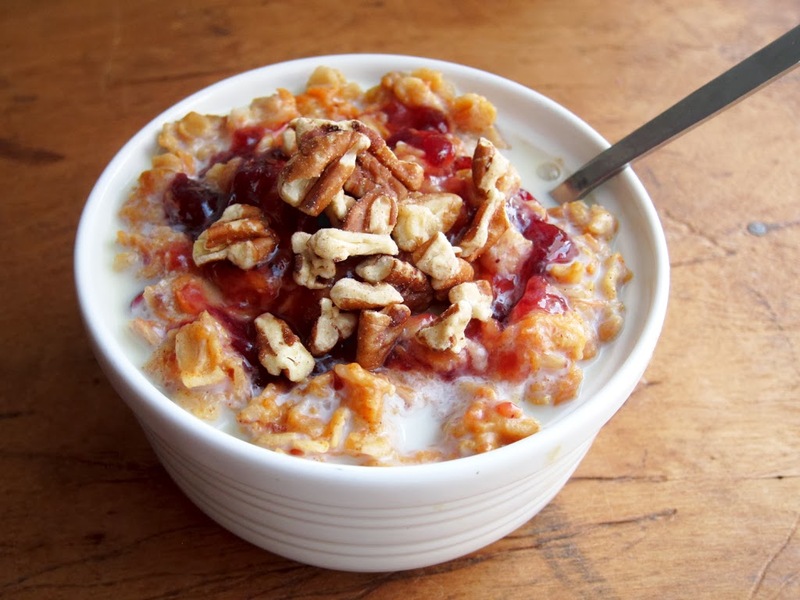 Every Saturday, I gather oatmeal recipes from around the web from the previous 1-3 weeks, as well as outstanding Instagram photos. These posts may grow or evolve as time passes. Please feel free to give your feedback in the comments section! This week’s theme is carrots! Morning glory oats! I vividly remember shredding carrots and zucchini on our cheese grater in college to make this and now idk how I did it. Thank god for the food processor ?? I’m not going to sugar-coat this: I hate these pictures. 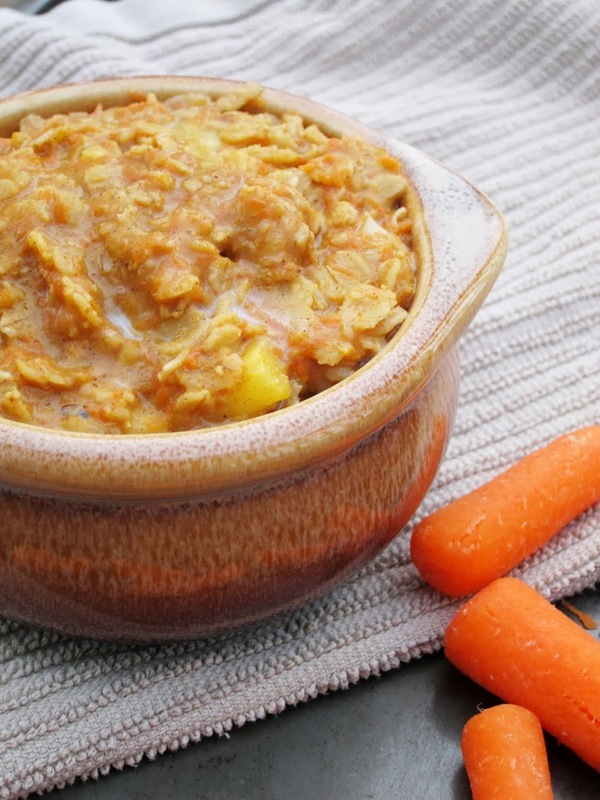 I planned to post this recipe ages ago, but I hated the pictures too much. However, I’m also too lazy to retake them. Ugly pictures it is, then. TWO recipes today! 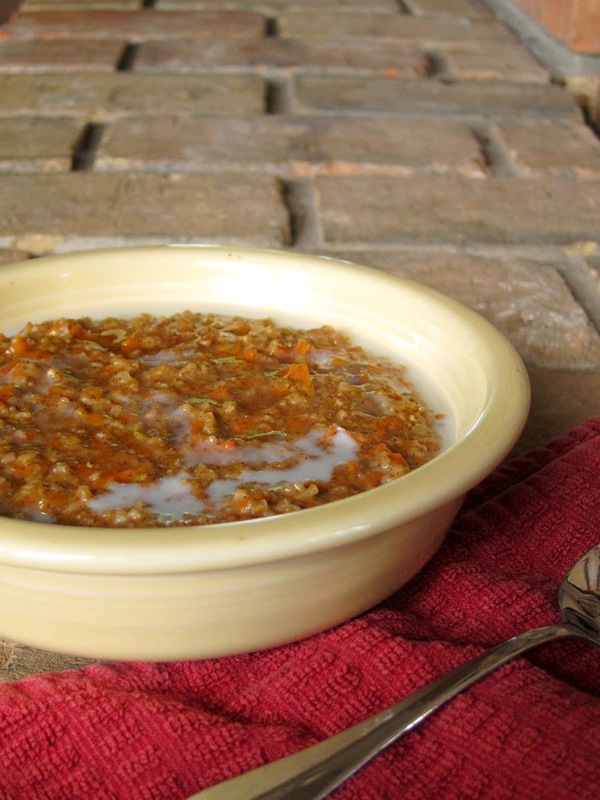 You’re welcome.Carrot Cake Steel-Cut Oatmeal isn’t that exciting; it’s basically an adaptation of my regular Carrot Cake Oatmeal. The only difference is it takes longer to cook (and it serves four instead of one, but that’s just an issue of multiplication and division). 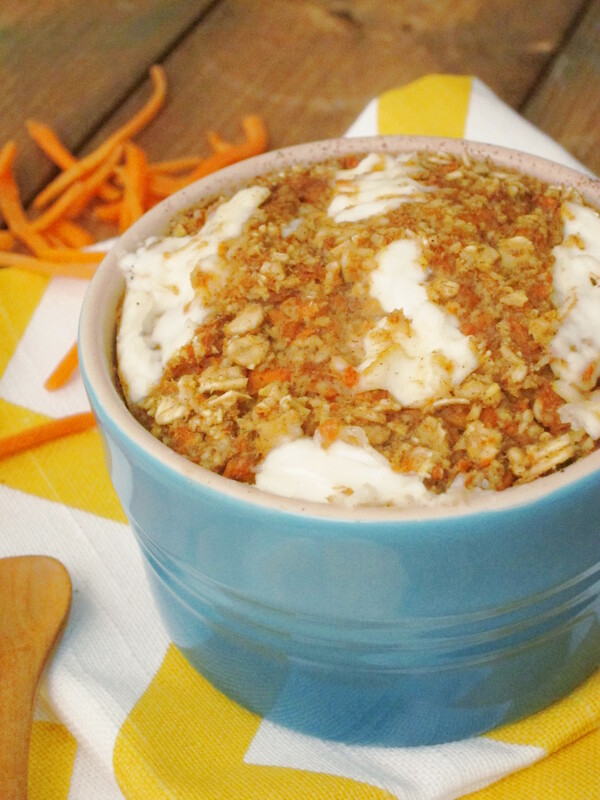 I can’t say much about the Carrot Cake version–it’s exactly what you would expect. Instead, let me tell you about the banana version. Considering I’ve only eaten Indian food four times in my life, my knowledge of Indian cuisine is minimal. I have never eaten “Indian dessert” and have absolutely zero concept of what it’s like or what it should taste like. Thus, when a reader begged me to create a halwa recipe, I had to reject her, claiming that I had no idea what it was or what it should taste like. Did you know I used to hate ginger? It’s true. If you look at my early recipes when I used ginger, it would always be a teensy tiny pinch. I can’t remember when my feelings changed, but I have a much higher tolerance for it now. I much prefer fresh ginger, but now that I’ve acquired a taste for it, I’m fine with ground ginger. I thought half a teaspoon would be too much for this recipe, so I started with just a quarter teaspoon. After a few tastes, I continued adding more bit by bit, until I finally had added half a teaspoon total. Perfect. I recently realized I have some cranberry goodies left from the holiday season. My roommate had a bag of fresh cranberries (which she said I was welcome to), and I had half a jar of Trader Joe’s cranberry sauce. Perfect! 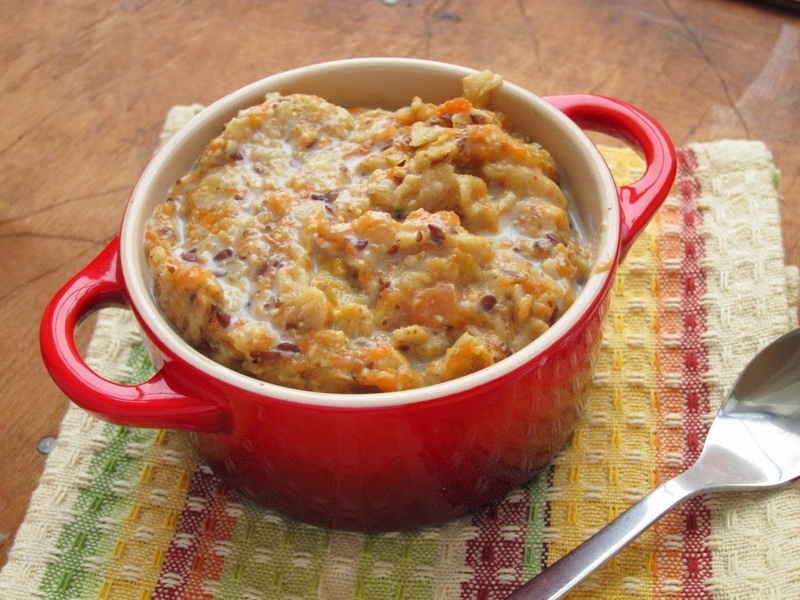 In case you haven’t noticed, I love using earthy ingredients like pumpkin, sweet potato, and carrots in porridge. 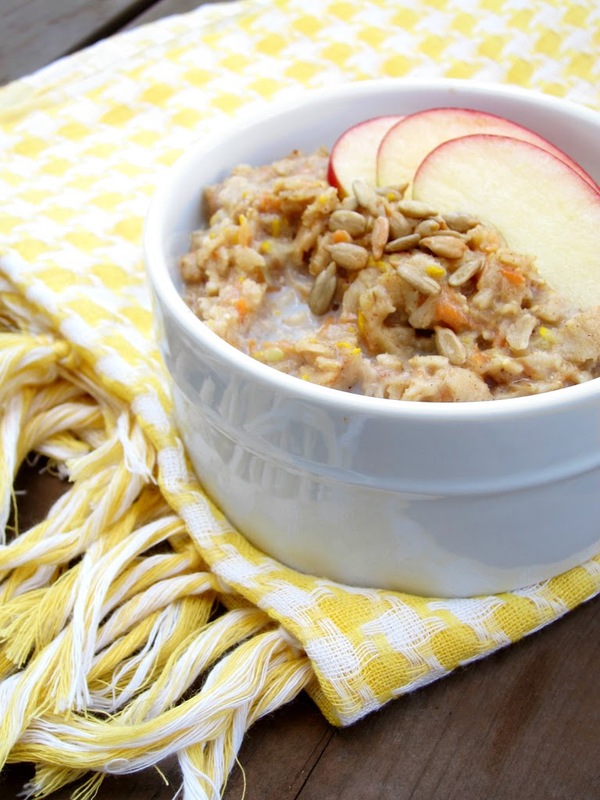 These ingredients create such heartwarming bowls of oatmeal that it can make even the coldest of mornings tolerable. The downfall of those veggies (although pumpkin is a fruit, apparently) is that they typically require an added sweetener. As you can tell from many of my recipes, I do not fear a small dose of maple syrup or honey. However, when I can sweeten something naturally, I much prefer that. You guys, the worst thing ever happened. I came up with this amazing idea for a baked oatmeal, only to discover that somebody else beat me to it by a matter of days. Days!! Bummer. 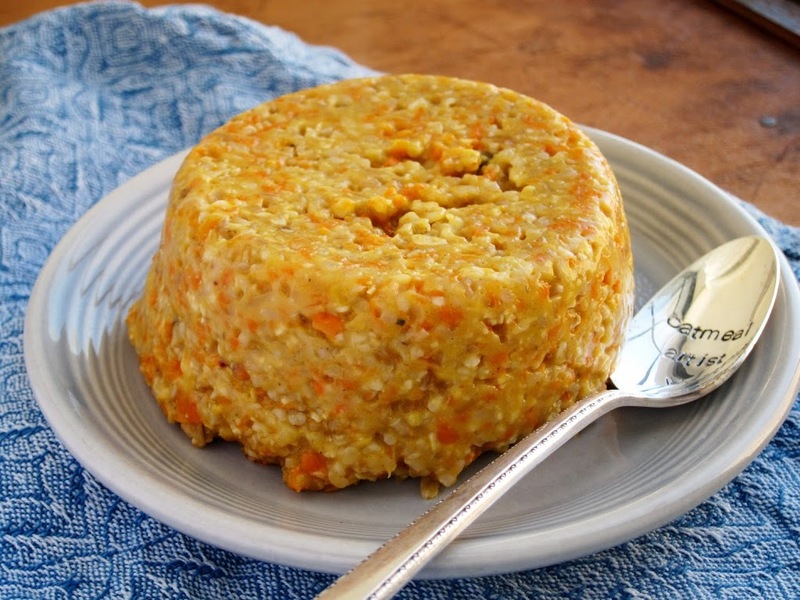 I literally said to my mother, “I have this idea for oatmeal using zucchini, carrots, and apple,” and two hours later, I stumbled on Oatgasm’s post on Foodgawker. I was distraught! On the other hand, I was able to use Oatgasm’s recipe to help create my own version, especially when it came to the spices. I’ve never personally experienced a Morning Glory Muffin, so I appreciated the assistance. However, I did do some tweaking to meet my preferences (like how I never have applesauce on hand). And, since Oatgasm mastered the baked version, I decided to bring you the stove-top version. Want it baked? Go to her. Want it on the stove? I gotcha covered. Don't miss a recipe! Enter your email to receive notifications of new posts by email. Copyright © 2019 The Oatmeal Artist | Wordpress Theme by Theme Fashion.